Surface Washing Methods: Commercial garages get very dirty, both from grease and oil on the concrete floor and from soot from exhaust on the walls and ceilings. 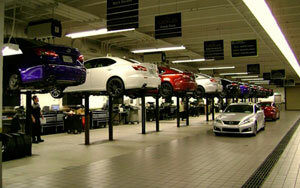 Commercial garages include automotive centers, truck and bus garages, and tire company garages. There are cleaning opportunities at almost every turn, if you know how to do the job properly. Job Preparation: Schedule plenty of time for the job. It is important to allow for drying time. Preparations include placing plastic sheeting over large electrical paneling to waterproof them. Duct tape, clamps, and electrical putty can all be used for this purpose. Look at the light fixtures to determine if removal of bulbs, or covering will be required. Cover electric motors on the garage door openers with plastic. A garbage bag works well. Waterproof switches and outlets, covering them with duct tape works well. If things are really dirty, you may need to clean these with a damp towel with detergent on it before the tape will stick. Turn the power off first to avoid shock. All vehicles should be removed from the garage, and tool boxes, jacks, jack stands, etcetera should be all put in an area that you plan to wash last. Determine where the wastewater will go. Plan for recovery if there isn’t an approved functional drain system. Detergent: This isn’t the kind of job where you want to use a weak detergent product. Use Power Stroke or Mr. Muscle to quickly cut the carbons and the soot and to remove oils and grease effectively. Down stream inject the detergent in most areas. There are two areas where a stronger concentration can be helpful. One is walls that are greasy from hands. If you encounter this problem a 1-part detergent to 4-part water mix directly applied will help. The other problem area will be on the floor where grease and oil is the heaviest; here directly applying a 50/50 mix to the worst areas is advised. Dry Time: Do anything possible to speed the drying process. Leave all the doors open. Remove all the tape and plastic from the electrical system. Turn on just enough power to run any ventilation system and floor fans. Create as much air flow and movement as possible. As a precaution, wait as long as possible before turning on the rest of the electric circuits. This is so any water that got by your waterproofing has a chance to dry. Equipment Washing: In the area of the garage that hasn’t yet been cleaned, degrease and wash the floor jacks and stands. After they are washed distribute the equipment back into the garage. Next wash the remaining ceiling, walls, and floor. If there is standing water, use as squeegee to remove it. Wall Washing: Wash walls by downstream injecting Power Stroke or Mr. Muscle onto the surface and pressure washing it off. Wash garage doors and man doors as they are encountered. Immediately wash the exterior of these doors after washing the interior side. Many times waste will run down the outside surfaces of the doors and stain them if it is allowed to dwell there. Leave walls that are blocked by the equipment until later and proceed to the floor. Floor Washing: The first step when washing the floor is to work on the heavy grease spots. First, using a rotary nozzle, quickly rip the heaviest of the grease and rinse it away. This is important for really heavily greased areas because the detergent works well on the surface, but can’t eat through thick grease. Next direct spray the 50/50 mix of detergent onto the bad areas, and then downstream inject detergent onto all the surrounding areas. Let the detergent dwell for five to ten minutes. Using a thick bristled garage floor broom to agitate the detergent is helpful, but not a requirement. Wash the floor hard with a surface cleaner of pressure wand. Leave the floor with the equipment on it until the end.